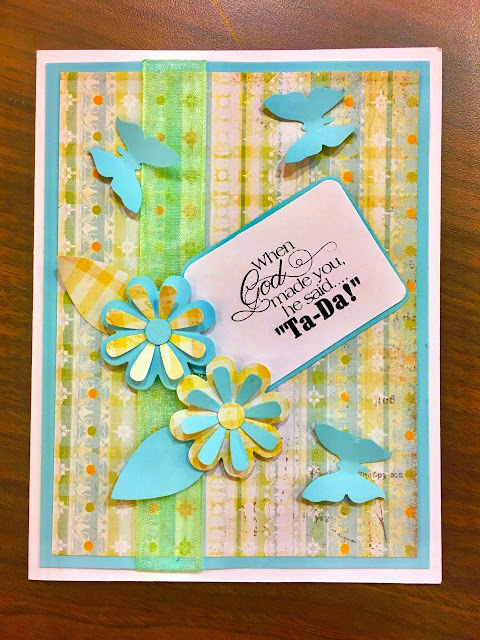 This little card was made with a sweet sentiment from TLC Creations. Also used were Martha Stewart Royal Butterfly Punch, EK Success Flowers and Leaves Punch (which was a new punch) and a light green ribbon. It was very simple to make (once I planned it all out in my head!). Very pretty card, great background paper and accents. Thank you for joining us at Connie Can Crop. Oh this is just beautiful and I love your fabulous sentiment to go with your gorgeous creation. Nice work. Beautiful card! Thank you for joining us at Making Memories Crafting! Love the design and coloring on this card and I really love the greeting! Thanks so much for joining us at Connie Can Crop's monthly challenge, Anything Goes. Good luck!